Promotional Items. Affiliate Shopping Links. Yes, it’s only August 15, but I’m ready to teach my first lessons of the school year. So follow along with me, my intelligent, wise, and beautiful class. Open your textbooks open to page blah-blah-blah-blahbady-blah…. Lesson number 1: Influenster.com is legit. In a nutshell, it’s a social media, fueled, product “review and hype” site. Here is the truth about me and Influenster: I was hesitant to even get involved with it because I am not a consistent sharer on social media. Although I write this blog, I am only somewhat social-media hip or proficient. I am a private person, and I chose carefully what to share and with whom. I do not like overburdening people with the details of my life, or “tagging” friends to try and win contests. I don’t like being connected every moment or even every day, and I sure don’t want everyone to know where I am…. like ever! (The most puzzling social media outlet to me is Foursquare. Would you actually like to know when I go to Walmart for cat food? Didn’t think so.) I primarily stick to Instagram and blog posts, which are then posted on Twitter, Facebook, and sometimes Pinterest. I have a point here. My point is that if I can get something out of Influenster then you can too. Give it a try. You can almost count on receiving free products if you join and connect your social media accounts. You don’t have to “win” contests or sell out your friends to get goodies. Influenster sends out “Voxboxes” with varying amounts and brands of products each month. The box you get is based on your profile and answers to “snaps” and also based on your Influence level (I don’t know why they are called snaps. But just take my advice and answer them, even though they have a strange name). There is also some black magic and chance involved. They only have so many of any one box to give out, so I assume it’s random within the qualifying population. But hey, I am NOT complaining. Free stuff. It’s awesome. If you are interested in joining, please use my referral link to sign up: www.influenster.com/r/1781889. My voxbox from Influenster with Kat Von D Lock-It items! Lesson number 2: Kat Von D is a vegan, and her cosmetics line is full of vegan and cruelty free products. 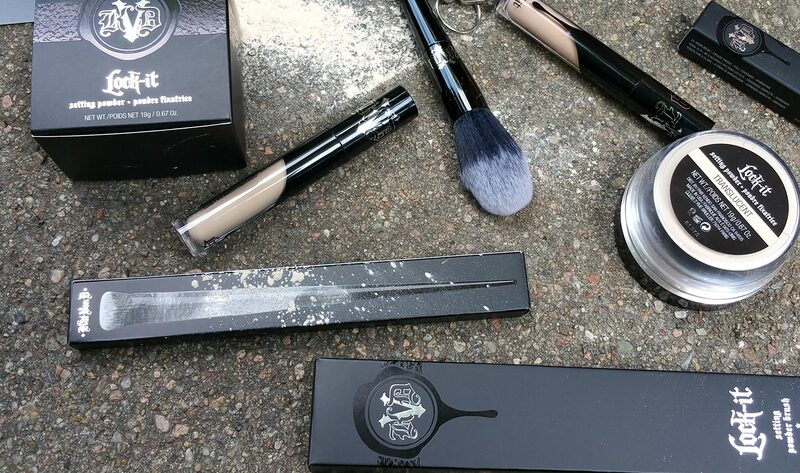 Rumor has it that KVD Beauty will be a totally vegan makeup line in the future. But don’t quote me on that. What’s important to me is that it’s cruelty free. Funny thing is that I had not last used Kat Von D Beauty for years before receiving this voxbox with new products to try. But only a few days before I found out I was getting the KVD box, I read that she was “vegan as f–k” and that her makeup line is heading that way too. So I actually was planning to look into some of her products again. Especially because of that, the KVD voxbox I received was over-the-top awesome. I received 2 different shades of her new Lock-It Concealer Crème, a Lock-It Setting Powder, a Lock-It Concealer Brush, and a Lock-It Powder Brush. Everything was incredible. I am having a blast with these new things, and yes, I am sharing it with the public, which is the whole point of Influenster, of course. I usually ignore gel and liquid concealers and go right for the stick or solid ones. Liquid is typically too messy and runny for me. So I was surprised by the new Lock-It concealers, because they are nicely thick (not clumpy) and don’t run. 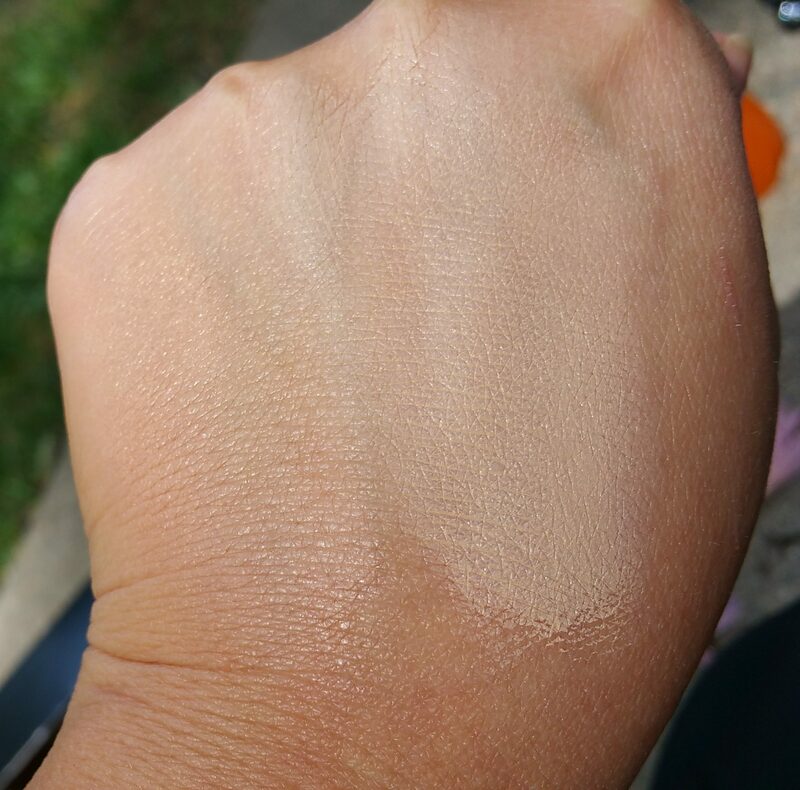 You can kind of tell from the swatches on my hand that their consistency is smooth and velvety, and that the formula totally covers the skin underneath of it. 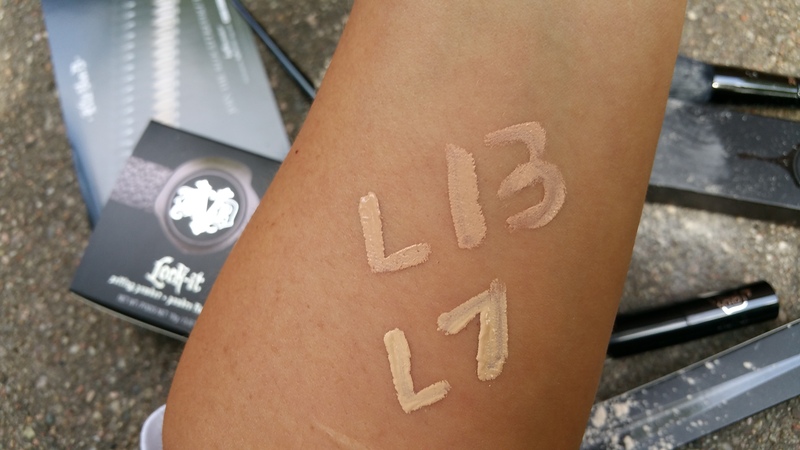 I’m impressed with these concealers, although I will only be using the cool shade, L13 (I assume Influenster sends a cool and a warm shade in each box, which is an awesome idea). I used my Kat Von D Lock-It Edge Concealer Brush (No. 40) to apply L13 to my under eyes. It made a huge difference in the outcome to use the brush. Honestly, I always assumed that the applicator tip for products like these concealers was the makeup brush. But, no. Very much no. I was wrong. Using the proper blending brush is huge! (this is from someone who uses her fingertips for almost every form of makeup, even for powder bronzer in a pinch!). I’m gonna say it again – I am impressed with Kat Von D. The No. 40 Brush, as well as the No. 20 Lock-It Setting Powder Brush, is sleek, nicely made, and has very soft bristles. The brushes are very aesthetically pleasing and feel like good quality tools. The one product that I am not sure about is the Lock-It Setting Powder. It’s a bit strange to me that this product immediately sold out of stock at Sephora and that it’s all the rage on social media. It seems to me like a fairly typical setting powder. My disclaimer is that I pretty much never use loose powder, and I just don’t know if this one is superior to others out there. However, I had good results with it either way. I loved the way my skin looked after applying the Lock-It Concealer, and I was initially hesitant to add powder on top for fear of ruining it. I guess that was kind of silly and irrational. The powder, applied with the big, puffy No 20. brush, blended right into the concealer effortlessly, and my concealer didn’t crease or sweat off. That’s just about as much as I can ask for in the concealer/coverage arena. Let me show you some close-ups of the concealers. 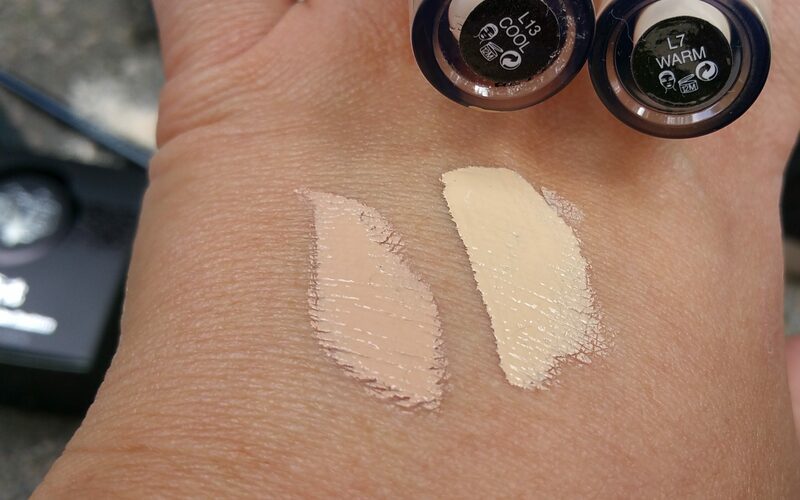 Kat Von D Beauty Lock-It Creme Concealers, in shades L13 (Cool) and L7 (Warm), left to right. Kat Von D Beauty Lock-It Creme Concealers, in shades L13 (Cool) and L7 (Warm), left to right, swatched and blended out. Since receiving these Kat Von D items, I’ve been using almost daily the Lock-It Creme Concealer in L13 and compatible applicator brush, No. 20. I just haven’t gotten into the habit of using setting powder every day, but I’m keeping it close by to use next time I get really made up to go out. I’ve also been scoping out KVD Beauty’s other products and social media announcements to see what other products I may want to try! There are many items that are too vampy for me, but then again, KVD seems to have surprises on the way (like that Too Faced collab palette…!). What do you think? Do you use KVD? Are you already on Influenster? The product or products featured in this post were provided as promotional items to me from Influenster. The content regarding opinions is my own, honest writing. PREVIOUS POST Previous post: Unbranded: Are These Items Even Better than the Brand Name Versions?